We're three episodes into DC's Legends of Tomorrow, and getting a feel for the team dynamic as they travel through time trying to stop the immortal villain Vandal Savage (Casper Crump) from destroying the world. It turns out to be more chaotic than even expected, since Time Master Rip Hunter's (Arthur Darvill) mission is apparently not-so-sanctioned by his bosses after all - and in addition to that tricky butterfly effect, there are all sorts of things that can go horribly wrong, when you mess with the timeline. 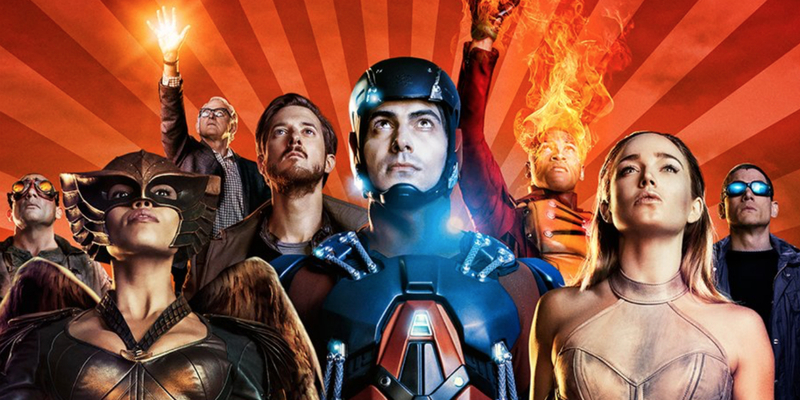 Legends of Tomorrow mined The CW series Arrow and The Flash for its main characters, bringing together The Atom (Brandon Routh), White Canary (Caity Lotz), Captain Cold (Wentworth Miller), Heat Wave (Dominic Purcell), the two halves of Firestorm (Victor Garber and Franz Drameh), Hawkman (Falk Hentschel) and Hawkgirl (Ciara Renée). The team has already lost Hawkman to Savage's energy-absorbing murderous rage, but the combination of the destiny duo's resurrection skills and time travel means we'll likely be seeing Carter Hall again in some form. With the spin-off show's characters so tied to Arrow and The Flash, it's not surprising that we'll be running into more heroes from those two shows in future installments. As the above video from DC Entertainment reveals, the Legends group will be landing in Arrow's Star City in an upcoming episode. The twist is that it will be in 2046, in a future where Savage's victorious efforts see the city in smoldering ruins. This isn't bad news for all the characters, it seems. As actor Purcell reveals in DC's behind-the-scenes clip, his character Heat Wave is happy to be "surrounded by like-minded people...criminals...sociopaths." This leads to some strife with buddy Captain Cold, possibly due to that conscience we've seen him slowly developing on both The Flash and Legends. Things will be more difficult for Sara, who the official episode synopsis declares is "despondent over the destruction of her home." She'll also be shocked at the state of an older Green Arrow (Stephen Amell) who, as we learned last month, will have lost an arm and gained a goatee. We've already seen the Legends team stranded in the 1970s, unable to make another time jump due to Hawkgirl Kendra's life-threatening injuries. In this upcoming episode, a Waverider malfunction crashes the characters in 2046. Rather than being part of their ongoing mission to interfere with Savage's plans, this unexpected visit will likely serve as more of an emotionally compelling motivation to do anything they can to stop this (so far) unstoppable villain and the devastation he will cause. For viewers, the trip is going to be totally worth it if we get to see Oliver firing an arrow with one arm. The Flash continues Tuesday with ‘Welcome to Earth-2′ @8pm on The CW. Arrow continues Wednesday with ‘Sins of the Father’ @8pm on The CW. Legends of Tomorrow continues Thursday with ‘White Knights’ @8pm on The CW. Episode 6, "Star City 2046", will air on February 25, 2016.